Let's just keep everyone out and see how that works. President Obama has about two years left in office. This is about the time when two-term Presidents begin to work on fashioning their legacies. If this President follows the template established by a few of his predecessors we can expect to see a flurry of feel-good initiatives that are designed to put a high-gloss patina on a legacy of something less. That’s OK. As long as President Obama confines his legacy ambitions to things like pardons, giving out awards, encouraging investment in infrastructure and building a library somewhere, it’s all good. There is one thing, however, that this President really needs to avoid, and that is bolstering his legacy through public land policy without the consent of Congress. A prominent recent example of this was the creation of the Grand Staircase-Escalante National Monument in southern Utah in 1996. Under the authority of the Antiquities Act, President Clinton, with the stroke of a pen, placed almost two million acres of recreational land (an area about the size of Delaware) squarely under restrictive Federal control. While I do not question the legality of this action, I absolutely question its wisdom. I would estimate that this single act of federal arrogance has played a huge role in making large parts of the West unfriendly territory for Democrats for about a generation. Unless Democrats want to make that two generations, they’d do well to counsel President Obama to not repeat this mistake. At this moment there is a push from some quarters to have President Obama, à la President Clinton, use the Antiquities Act to create a large federal monument in Central Idaho – The Boulder-White Clouds National Monument. Some special designation for this area has been in the works for many years in different guises. I have especially appreciated the efforts of Representative Mike Simpson (R-ID 2nd District) to hammer something for this unique area that a number of stake-holders could live with (even if they didn’t all love it). I had little problem with Representative Simpson’s plans, even though I didn’t agree with everything about them, because they were part of a fair process in which I and others had opportunity to provide meaningful input. If I don’t get what I want out of a fair process, well, that’s too bad for me. But given the desire by some to have President Obama accomplish by fiat what cannot be accomplished through negotiation, others, evidently, do not feel the same way. I do think that the Boulder-White Clouds are unique. I do not have a problem acknowledging this with some special designation so long as a variety of affected stakeholders are consulted and have meaningful input. It is clear that using the Antiquities act to achieve National Monument status without Congressional approval (and local input) is a method of circumventing all of this. It’s also a colossally bad idea. I do not personally know a single person in Custer County, where the bulk of the land for this Monument would come from, who favors National Monument designation. Not one. I also doubt that there are more than a few dozen (if that many) registered Democrats in that area. Most of what passes for local support for this Monument seems to originate from Ketchum (or at least PO boxes there) and Boise. The upshot of National Monument status for the Boulder-White Clouds seems to be that life will go on as usual except for people who ride snow-machines, motorcycles and ATV’s (and for those who participate in some ranching activities). Curiously, I have seen very little evidence that these devices pose significantly more of a hazard to this area than human use in general – something that would not be banned. If you really want to “preserve” the Boulder-White Clouds from human activity then close them – to everyone. Even though I’d personally give it some thought, good luck pushing that in Ketchum and Boise to the “preservation” set. In the meantime, I challenge anyone to prove that riding a sled or motorcycle in the area poses a greater threat than the burgeoning population of humans crawling all over it. I’m betting that you can’t. “I just don’t like it,” by the way, doesn’t count. Unless there is a damned good reason, public lands should be open to as many groups as possible, not as few as possible. It’s just not up to me, you, or anyone else to decide which forms of recreation are implicitly worthy and which are not on public lands. The Boulder-White Clouds happen to be a mighty big place, and I think that there is probably room in there for all of us. If President Obama decides, foolishly in my view, to designate this area as a National Monument, he may actually be contributing to the further diminution of an already endangered species – Western Democrats. 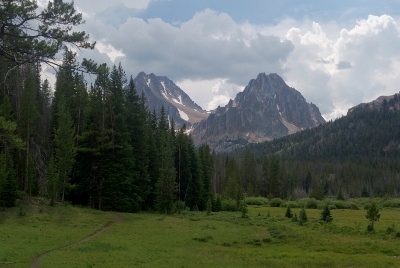 * National monument designation would impact the current Tour of Idaho.